Fifi and Fluffy are making you crazy again. Fifi won’t stop barking. It’s yap, yap, yap until you think your ears are going to explode. And Fluffy is shredding everything in sight. You have a scratching post for her, but she apparently thinks your sofa was made for kitty claws. What can you do to get your dastardly dog to desist and your crazy cat to quit this terrible behavior? 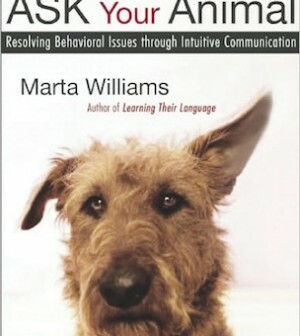 In the new book Ask Your Animal by Marta Williams, you’ll learn how to clearly communicate with your pets in ways that might amaze you. Animal lovers don’t need to be told that our four-footed companions have rich lives. We know dogs daydream and cats have great imaginations. But can we get information from the horse’s mouth – literally? Williams says that you can learn to tap into your animal’s thoughts by learning what she calls “intuitive communication.” Animals will tell you what they think or why they act the way they act, if you just ask. But how do you play Dr. Doolittle with Dusty or Dylan? Williams says it’s not all that hard. You don’t even need to have your animal with you, but it might help to have him or her there at first. Relax, Williams says, and open your mind. Be receptive to getting and receiving communication. Feel an emotion or form a question in your mind, then send it toward your animal. At the same time, send a thought-picture, too. Have a notebook handy, and write down the first thing that comes to mind. Could be – particularly if it’s something you wouldn’t normally think – your animal is sending back a message. Williams says that, once you get the hang of this, you can have “conversations” with your pets, as well as with barnyard critters, animals you don’t know, and with wild animals. Intuitive communication can help find missing pets, it can help eliminate behavior problems, it can pinpoint health problems before they get out of hand, and it can enrich the relationship you have with your furry charges. Author Marta Williams offers dozens of case-studies and stories to back up her ideas, but I wanted to give it a whirl myself. My Lucy is a Lhasa-Yorkie; a bit of a fluffhead and an occasional whirling dervish. We’ve had issues, she and I, about her propensity to eat anything she finds. Using Williams’ techniques, I had an out-loud discussion with Lucy, followed by a mental storyboard in which I explained that eating yard detritus was icky. And, much to my amazement, she immediately did something she never does: she asked to get on the sofa, and she sat next to me, quietly. In the meantime, Ask Your Animal is a bit New Age-y and might make some critter caretakers skeptical, but I think it can only deepen your relationship with your four-footed friend. If you’re a pet parent or an animal lover, be sure to ask for it.